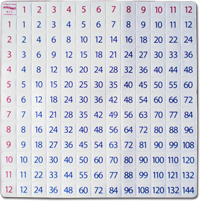 The Flexitable programme consists of a multiplication, an addition, a number and a fraction grid all printed on soft flexible plastic that has vertical and horizontal channels allowing children to continuously fold them again and again. What was the best thing about the resource? The best thing about this resource was that it looked and felt great, the children really enjoyed fiddling with it, and it was fun for all of them to do together. The worse thing about this resource was that it was hard to convince the elder two that it was a ‘game’! What new skills did they learn? There was quite a lot of new vocabulary for the children to learn, for example, ‘factors’, ‘quotients’, ‘multiplied by’ and ‘divided by’. Jamie learnt a lot from the fraction and percentage Flexitable. It took him a while to master but he gave it his best shot. Jamie thought of it more as something that might help him at school rather than something he would play with. Alfie and Rosie liked me shouting questions at them and them racing to find the answers. Would you recommend buying Flexitable? Yes I would recommend buying this product; they are light and easy to store and would be good to refer to in helping reinforce the children’s maths skills.